Best 'Hindi to English' & 'English to Hindi' Dictionary with about 150000 words. Hindi to English Dictionary Free: Completely Offine & FREE app containing both English - Hindi and Hindi - English Dictionary in the smallest app size with about 150000 words. No need anymore for a translator or friend for translation to Hindi / English. This app is a quick dictionary and thesaurus with both hindi / english meanings for almost all words. Our Hindi to English and English to Hindi dictionary works in OFFLINE mode. No internet connection is required after the app download. So you can carry this dictionary with you everywhere in ur cellphone for use when you have no net connection. This fast and free app provides detailed meaning with definition. It has the largest database of words. * English to Hindi section (अंग्रेजी - हिन्दी शब्द अनुवाद): Find hindi translation / meaning for english words. 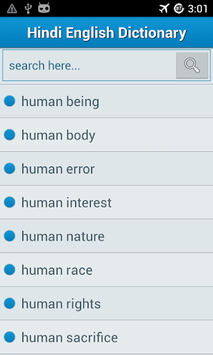 To search, type the word you want to search in the search field & the matching words will be listed automatically . * Hindi to English section (हिन्दी - अंग्रेजी शब्द अनुवाद): Here you can find hindi to english translation. No need to separately download another dictionary app for this. - Low memory usage and small size. - Move to SD card option after download. - It is an OFFLINE dictionary that will work without an internet connection. 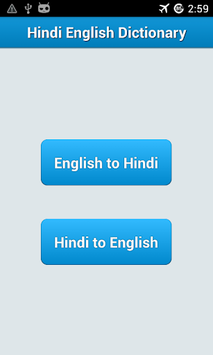 - You can use Hindi language keypad for Hindi word searching. - Fast searching Pro dic language software. - Easy to use simple app interface with new look and feel. - Has facility to input in Hindi and search Hindi Words while typing. - Help in preparing for language based exams like CAT, GRE, GSAT, CSAT. - Provides Hindi Font display across devices. - English / Hindi meaning for about 150000 words. - A comprehensive free hindi dictionary during word games and spoken English learning. This is not only a Dictionary but also a vocabulary and learning tool. Use this dictionary ( hindi to english and english to hindi ) free of cost & reduce the hardships in finding out English meaning of Hindi words and vice versa. The translator is available at word level and not at sentence level. This app is also the best reference guide amongst school apps for kids. Help us to make this free dictionary as the popular and best rated app book for hindi translation to english. NOTE: To search in Hindi, change your phone's keyboard settings to Hindi keyboard.